Blueprint Genetics is taking part in the ACMG Annual Clinical Genetics Meeting on March 22-24, 2017. 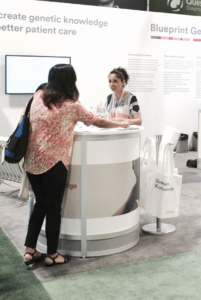 Join our booth #1031, where we are excited to present our whole test offering and introduce our new methods and services including the one of a kind Connecting Clinicians network. On Friday, March 24, we will hold an educative seminar and discuss the challenges on selecting the optimal genetic testing strategy for your patient. Join the seminar on Friday, March 24, 2017 at 10:45 at the Phoenix Convention Center, room: Exhibit Theater 2. Define the limitations in current genetic testing technologies. Identify the best genetic test in different clinical scenarios. Construct solutions for overcoming limitations in genetic testing. Tero-Pekka Alastalo, MD, Ph.D, will discuss the challenges presented in selecting genetic testing strategies with case examples used to illustrate how to optimize this process. The current limitations of genetic testing strategies, how to recognize and to overcome them will also be discussed.